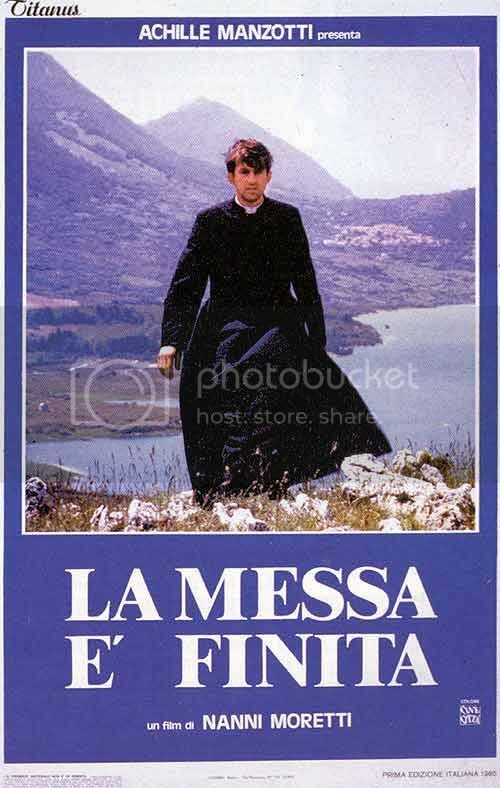 La messa è finita (Mass is finished) is an early Nanni Moretti film that exhibits many of Moretti's trademark moves: domestic bliss and domestic hell (both filmed enticingly), a counsellor distracted by his own anxieties, long shots of Moretti from behind as he wanders through his comfortable apartment and an easy-going, bourgeois sensibility. Moretti's thinly veiled alter-ego is, in this case, Giulio, a young priest. We follow Giulio as he moves to a new parish, closer to his parents in Rome, and mingles with the community. People come to him with all sorts of problems - generally, heartbreak - and, as things strike closer and closer to home, it begins to weigh on Giulio. He lashes out, an angry young man, and (as usual, in Moretti films) gets no closer to the elusive truth. We suffer - all his movies seem to say - but it can still be beautiful. "My life is beautiful," Giulio declares, even as he cries about all his problems. La messa è finita is guided by thin threads of plot, but it's not as completely impressionistic as Moretti's later (and stronger) film, Caro Diario. Nonetheless, it's filled with the same abrupt cuts and vignette-style scenes as his other later (and much stronger, if not best) film, The Son's Room. Its meandering, circling style may bore or alienate some viewers, but we love it - in fact, it fills us with a deep, soothing contentment, similar to a Morandi painting; the beautiful in the mundane. The film's conclusion doesn't leave as much of an impact - Moretti achieves that feeling of fraying, tender relationships with much greater clarity in The Son's Room - but it's always nice to spend a couple hours walking behind him. Recommended.